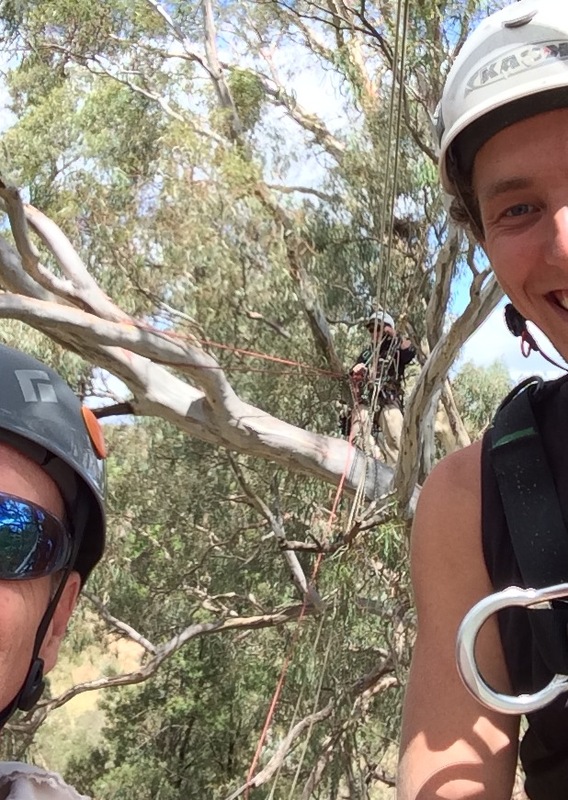 I went up some massive red-gums with Nick Timpson and Pierce on the weekend. These guys are rope access workers in Nicks business in Melbourne but still retain the fun of rope stuff in rock and tree climbing. Very interesting to see their gear and methods, Nick has some of his own designs for grappling hooks and a fantastic progress-capture / controlled-release device. Nick and Pierce lead up the first tree and I just tagged along. The process is to get a line over a branch and ascend it. Nick did the tricky moves — grappling hook the next tree and moving across, then setting up a line for us to traverse. This kind of rope management makes you get organised; I got into a few tangles and took ages to get a couple of meters at times. Interesting problems to solve; a puzzle with dire consequences if you get it wrong at 20m of the ground! Great to work on lowering-out to traverse and recover your rope, something that applies to the aid climbing I’m learning along with experience with exposure. I think their methods are part arboriculture and part rope access. Interesting in that there are so many different techniques and in the end you settle for what makes sense to you. After almost three hours hanging in my climbing harness I had to rappel out and was walking like a cowboy for the rest of the day. These guys had supper comfy full-body harnesses on, Nicks incorporated a seat. It’s all heavy gear: steel carabiners and devices, but my aluminium stuff was useless as a throwing weight on the end of a line… I actually said “my carabiners are not heavy enough” at one stage. I think those guys went on to cross four or five of the beautiful red gums near our local creek that afternoon. Nick is also into multi-day traverses, staying off the ground and moving through a forrest. As Nick says you can have a lot of fun close to home, which it was.